At recent marketing conferences presenters mention a statistic well known by B2B marketers whose buyers go through a complex decision-making process. By the time you receive that initial inquiry call or email, the prospect already knows a lot about you. Or at least they think they do, based on your online presence. Think about it. Would you contact a company without doing any research first? Could you imagine the waste of time asking what they do and other basic questions during that first call? Central to that complex B2B process and likely the starting point is your website. Does it anticipate the typical buyer’s questions? Does the site present content that allows them to form an accurate opinion about your product or service? Buyers are under pressure to make the right choice and won’t stop at your website. Along that 57 percent journey they’ll also check out Google, especially for reviews or third-party news stories that shed an independent light about your product and your reputation. They’ll also look at your social media presence, whether you like it or not. No Twitter updates since 2016? That tells them something. Do you have a lively Instagram presence? You should, whether it’s to attract potential employees or share some professional product images or a glimpse of your company’s culture. For B2B purchasers, LinkedIn is the go-to and might even be the first stop. Not only will prospects view your team’s bios, they’ll want to see what your top people have to say. Do they show thought leadership in your industry? Or is it just the standard fare. With that setup and background in mind, I’m here to welcome you to the new Van Eperen website. 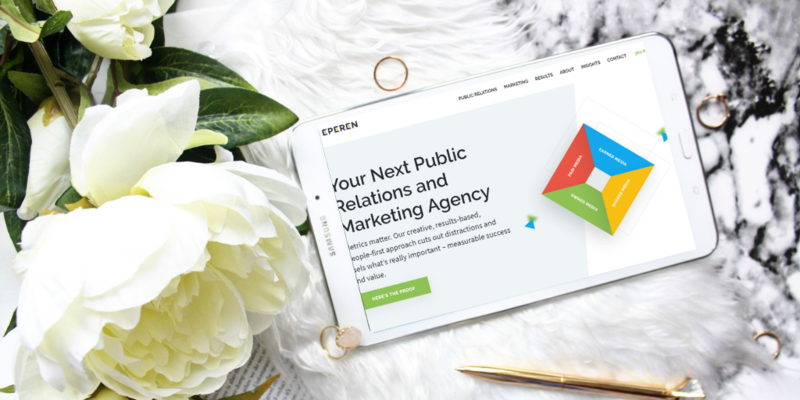 If you searched for “best PR firm in Baltimore” or “top strategic communications agency in Washington, D.C.” we want our new website to confirm that you’ve come to the right place. Our information is organized around our primary practice areas, Higher Ed, Transportation and Health & Science, featuring brief case studies showing client successes. You’ll also find bios of our outstanding leadership team, testimonial quotes from our clients, a news page and my favorite section, the Van Eperen blog where we share our insights and hope to challenge thinking and demonstrate what sets us apart from other communications agencies. Feel free to peruse our social content and website to find bonus nuggets of information, from what Laura Van Eperen does in her spare time to our award-winning case studies to Claire Howachyn’s PR take on the Fyre Festival. Does it look like we can help with your PR and marketing communications challenges? Then consider your journey 57 percent complete. We’d be happy to take your call!